Emeritus Curator at the State Library of New South Wales. The heritage-listed State Library of New South Wales is the oldest library in Australia and is open for the general public’s use. It was established in Sydney in 1826. A large section is known as the Mitchell Library which holds special collections as well as a reference and research library. In his 40 years at the library, Emeritus Curator, Paul Brunton OAM, presided over the acquisition of more than 40,000 collections and millions of items. These include First Fleet midshipmen's Newton Fowell's twelve letters to his father in Devon, the George Bass collection, and a children's jigsaw puzzle made in 1771, encompassing one of the earliest world maps showing James Cook's voyage in HMS Bark Endeavour. Brunton was curator of the Library's exhibition Matthew Flinders: the Ultimate Voyage which opened at the State Library in 2001 and exhibited nationally during 2002-2003. 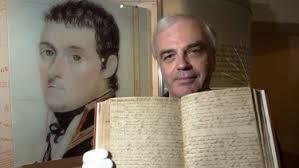 His annotated edition of Flinders’ letters, Matthew Flinders: personal letters from an extraordinary life was published in 2002. On his retirement Brunton was granted the rare honour of Emeritus Curator, allowing him to continue his work. Arthur Phillip Chapter was very fortunate to have Paul Brunton address our General Meeting on Friday 22nd February. His subject was Matthew Flinders, one of Australia’s greatest explorers. Flinders' naval career between 1791 and 1794 was on HMS Providence as midshipman under the command of Captain William Bligh. He arrived in Australia during 1795 on board HMS Reliance already having established himself as a fine navigator and cartographer. In 1796 he explored the coastline around Sydney in a tiny open boat called Tom Thumb. Now elevated to the rank of lieutenant, he next proved that Tasmania was an island by sailing through and naming Bass Strait and circling the island. Flinders left Port Jackson as a passenger on HMS Porpoise. On 17th August 1803 the ship struck a reef, named Wreck Reef, on the Great Barrier Reef (which he had named previously). Remarkably, Flinders sailed the ship’s cutter back to Sydney, a distance of some 700 miles, and arranged the rescue of ninety-four survivors who were marooned on a nearby small island. I call the whole island Australia, or Terra Australis. Matthew Flinders' final resting place was recently found at an old burial site beneath Euston Station in London; his remains were identified by a lead breastplate. We had a "full house" for Paul's excellent address and, at its conclusion, members and friends showed their appreciation with enthusiastic applause. The Q&A session that followed demonstrated the audience's fascination with this subject. Cape Catastrophe, Memory Cove, Kangaroo Island, Prospect Hill, Mount Lofty, Gulf of St Vincent, Anxious Bay, Coffin’s Bay, Encounter Bay, Baudin’s Rocks, Troubridge Hill, Corny Point, Point Pearce, Mount Young, Port Lincoln, Point Boston, Boston Island and Boston Bay, Sir Joseph Banks’ Group, Point Avoid and Avoid Bay, Investigator’s Group, Thorny Passage, Investigator’s Strait, Yorke’s Peninsula, Gulf of St. Vincent, Spencer’s Gulf, Back-stairs Passage, Cape Willoughby. The Navigators – Baudin vs Flinders Part 1. Map by Matthew Flinders of South Australian coastline - nlamap-t573.